Today we took Ryan down to the New England Aquarium in Boston. She had loved Finding Nemo so much and took a liking to a fish tank on our trip to the little children’s museum in Derry that we thought the Aquarium would be a slam dunk! Ryan spent about an hour and a half cruising the aquarium looking at all the marine life. Her favorites were probably the penguins. I think Happy Feet has made her a penguin fan for life. 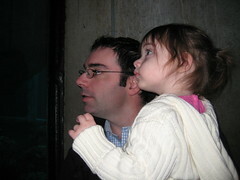 But she also liked the various fish, turtles, and seals. She had mixed emotions about the jellyfish, which she liked to say a lot, but wasn’t the most comfortable when actually in the exhibit. Thanks New England Aquarium for a fun day and some great memories.